These days many large consumer products, and virtually all industrial, agricultural, or construction machinery has the potential of causing serious injury during a repair or maintenance procedure. A lockout tagout procedure should be used on anything from lawnmowers to cultivating equipment to large off-highway machines whenever the potential for injury exists if the equipment is inadvertently started. If you are a manufacturer of equipment, you should at least alert operators, repair people, and other personnel, who may be in a potentially harmful position, of the danger should someone unknowingly start the equipment. 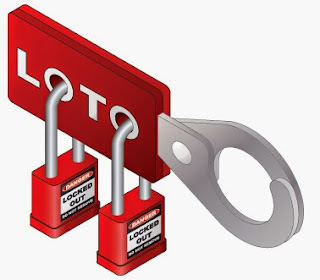 A Lockout Tagout (LOTO) program should be developed to cover machine/equipment maintenance and service procedures to which the unexpected energization, start-up, or release of stored energy could cause injury or death to the person performing that task. In the United States, on October 30, 1989, OSHA launched the Lockout/Tagout Standard, 29 CFR 1910.147, to reduce worker death and injury rates within a manufacturing facility. This standard can also be helpful in educating people when working on any type of consumer, ag, industrial, or construction equipment which has an equal potential for causing injury or death. Lockout tagout programs ensure that an energy-producing component cannot be used until the lockout device is removed. Lockout devices utilize a proactive approach using a key or combination lock, which prevents the starting of the machine or equipment. You should inform users that all lockout devices must be substantial enough to prevent removal without excessive force or unusual techniques. As a manufacturer of equipment, you may want to consider adding a design feature on your product that would allow the use of a lockout device. Also, be sure to stress the areas of potential danger in your owner/operator manual, as well as directing attention to the hazard with a safety sign attached to the equipment. This photo is something you never want to see associated with your equipment. I'm sure if the man pictured here could start the day differently he would. 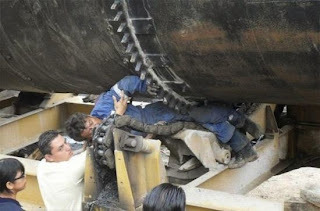 He should have made sure this drum could not be rotated while he was in a danger zone and/or that all stored energy that would cause the drum to rotate was released prior to the start of work. A state Lotto is a game of chance,but equipment LOTO is a matter of life and death!